PlayStation 4 vs. PC graphics: Can Sony even compete? Chip maker AMD will sell a cut-down version of the custom chip it developed for the upcoming Sony PlayStation 4 gaming console. 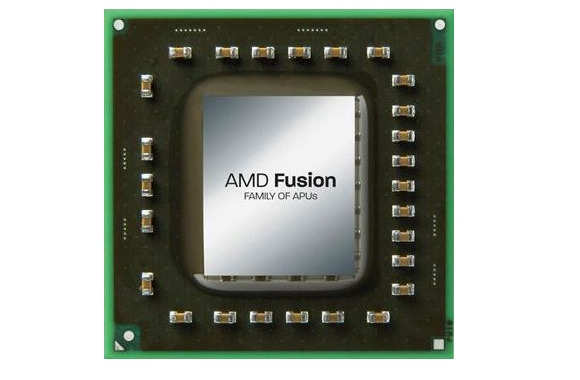 The accelerated processing unit (APU) from AMD won’t be quite as potent as the one destined for Sony’s console, but it will be very similar to the custom APU powering the PS4. AMD’s head of marketing John Taylor told The Inquirer that the PC-focused APU equivalent going on sale later this year will not feature Sony proprietary technology, which will remain exclusive to the PS4. 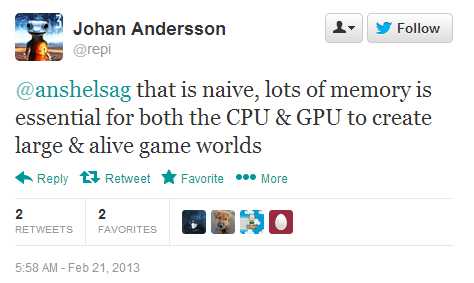 He went on to call the PlayStation 4's processor "by far the most powerful APU we have built to date." The finer details of AMD's next-generation "Jaguar" architecture are still somewhat shrouded in mystery, but we do know some details about Sony’s processor. The chip will have eight x86-64 CPU cores, while the GPU will be based on the next-gen Radeon graphics engine, capable of 1.84 teraflops of performance power. As with all AMD APUs, the CPU and GPU will be on the same physical die, with 8GB of GDDR5 memory to share between them. 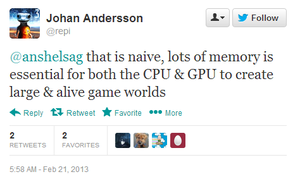 Johan Andersson, technical director at game developer DICE, is a fan of the PlayStation 4's stellar memory bandwidth. The PS4-inspired APU heading to PCs will have fewer cores and less computing capability than the chips made for Sony, Taylor said. We'd expect the PC version to cut the eight CPU cores in half, as AMD has previously stated that Jaguar-powered PC processors will have up to four cores. Unfortunately, the PlayStation 4's home run specification—the 8GB of unified GDDR5 RAM—will no doubt suffer from extensive alterations in order to play nice with standard motherboards, which will likely send the memory bandwidth plummeting from the PlayStation 4's sky-high 176GBps rate. By using an x86-based processing architecture for the PS4, developers should find it a breeze to work with the system, and the process of porting console games to Windows PCs (and vice versa) will also be simplified. The current-gen PlayStation 3 and Xbox 360 consoles both use IBM-designed chips, with developers criticizing Sony's deeply custom Cell processor as being particularly difficult to work with—a problem as consoles become increasingly computer-like. The next-generation "Xbox 720" console from Microsoft has also been rumored to use a similar Jaguar-based APU from AMD, but the console has yet to even be officially announced, much less detailed. The PlayStation 4's internals largely mirror those of traditional computers. When compared to PC-based gaming rigs, the PlayStation 4 is basically powered by a low-end CPU and a midrange GPU. When compared to prices of gaming PCs, however—which typically cost $700 at the low end—the PS4 could offer a better price-to-performance ratio, and in a much smaller package.